This is the one type of stitch which you will probably be using most often while working on your garment. 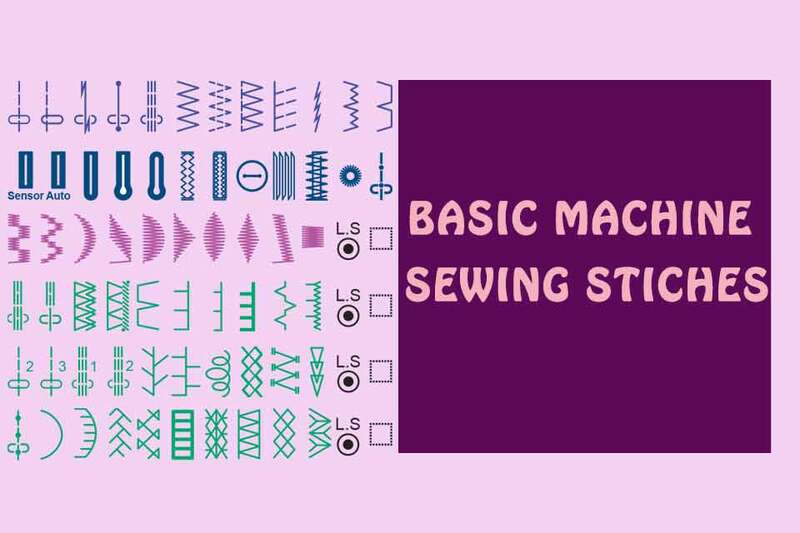 It is the most basic stitch that even the children’s models have (see for yourself – https://hellosewing.com/best-sewing-machine-for-kids-tweens-teens/). The straight back and forward stitch can be used for simple top stitching, stay stitching, under stitching and for seams. You can use this option in order to sew up to the far left if necessary. This stitch option will knot your stitch at the beginning and at its end, so you so not need to back stitch. Like the previous one, this stitch will make a knot at the start and end of the stitch, but it will be invisible. Use this stitch for sewing parts of the garment where both sturdiness and stretch are required, such as shirt armpits. This is the classic zigzag stitch you will be using often for various projects. It is commonly used for finishing as a combination with a straight stitch. Your machine should have the option of choosing and adjusting both the length and width of your zigzag stitch. Perfect for edge finishing of stretchy fabrics which tend to pucker when you use the regular zigzag stitch. Use this one for finishing fabric edges. Some sewing machines have a special overedge foot for easy guiding of the fabric while you use the overcasting stitch option. A great stitch for stretchy or knitted fabrics. Use it to stitch along the fabric edge and after that trim any excess fabric close to the wide stitches. Used for stitches which should stretch and for knits. Use this option when you need to sew a blind hem on a fabric which is stretchy. For sewing blind hems. It consists of a few straight stitches followed by a wide catch/zigzag stitch. The fabric is folded under the stitch, and only small dots are visible on the top. It can require some practice, but once you master it, it is a perfect option for quick hemming of skirts and pants. This option is available in some sewing machines and features a special foot in which you can fit your button, so that the machine can sew a buttonhole in accordance to its size. This one allows you to enter the size of the button, and the sewing machine will automatically make a buttonhole with the appropriate size. For making buttonholes on medium weight fabrics. Suitable for making buttonholes on delicate, light fabrics. Use this option when working on heavy or medium weight fabrics and bigger buttons. To be used for making buttonholes on stretchy fabrics. Suitable for making a buttonhole on a knit fabric. Used for sewing on a buttons – usually this option is paired with a special foot where the button should be fitted. For repairing tears, holes and rips on the fabric. For reinforcement of the stitch at places where extra strength is necessary, such as at the crotch area or when sewing pockets on garments. Makes an eyelet hole on the fabric. Stitches 25-34 All those are basically different decorative zigzag stitches which can be used for edging blankets and other projects. These can be either used separately or you can combine them in a pettern combination which the machine will sew repeatedly. It is formed with one stitch forward, two stitches backward, and a fourth stitch forward. It is used for topstitching suits, denim outfits, and blazers to achieve great looking hand-sewn look. Similar to the one above this one is again used for topstitching and outline stitching to make the appearance of the piece of clothing much more attractive. For finishing fabric edges which are prone to fraying. For making a professional looking fabric edge finish which is very similar to what a serger will do. Another decorative stitch option for lightweight fabric edging. For appliqueing, and for adding a pretty and neat applique edge. Are you already feeling confused and overwhelmed after reading all these options? Believe me, once you start trying out the different stitches which your sewing machine can do, and when you learn how and when to use them – you will find some or most of them absolutely indispensable for your future projects. Do not rush into trying each and everyoption at once. Take it slowly and learn how the different options work for different types of fabrics and projects. Once you master these, there is no doubt that you will find other stitching options and clever techniques which you can use for more advanced projects. Go ahead, and start experimenting with the wonderful stitching options which your machine has!